Neon pictus was first recorded in Britain in May 1998 on coastal vegetated shingle at Rye Harbour SSSI, East Sussex. 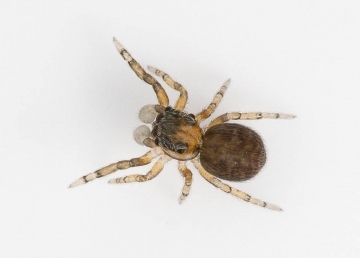 The spider has been found regularly since in small numbers throughout the area. It was subsequently discovered in June 1999 on a closely similar site at Dungeness SSSI, East Kent. Here it has been recorded in small numbers in both 1999 and 2000. This rather inconspicuous species may occur on shingle elsewhere in southern Britain. It is widespread in southern and eastern Europe, found from France and Italy eastwards to the Czech republic, Romania and Greece. This species closely resembles the non-British species Neon levis (Simon, 1871) and the two may well have been confused in the literature. At Rye Harbour, this species appears to be restricted to areas of either completely bare or sparsely vegetated shingle from near the shoreline to over one mile inland, where it occurs on disturbed areas of very old shingle ridges. The species has been found from May to October with adults between May and August. Only a single mature male has been found at Rye, in June 1999. At Rye, N. pictus occurs together with Salticus scenicus, Pseudeuophrys obsoleta and Sitticus inexpectus. At Dungeness, the species has been taken from the first to the sixth shingle ridge from the shoreline at Lydd and occurs both in areas of almost bare shingle near the shore and those with very sparse grassland of Arrhenatherum elatius occurring slightly further inland. Adults have been taken between April and August, with males present in June and July only. N. pictus is found together with Salticus scenicus, Pseudeuophrys obsoleta, Euophrys frontalis, Pellenes tripunctatus and Phlegra fasciata at Dungeness. The status of N. pictus in Britain is not yet fully established but at the three known locations the population appears to be stable. However, shingle habitats are prone to damage by leisure activities, commercial activities and exceptional tidal and wave conditions. Rye Harbour is an SSSI and part lies in a LNR. Dungeness is an SSSI part of which lies within a RSPB reserve. This species has been discovered too recently in Britain to be certain what threats it faces. However, parts of the Dungeness area have been severely damaged by gravel extraction and if this spider occurs outside the SSSI this could still represent a potential threat. Despite the high level of public recreational pressure on the immediate area in which it is known to occur at Lydd, there is no evidence as yet that this is affecting the N. pictus population. As with other species restricted to shingle habitats, protection from disturbance of shingle due to extraction, building and recreation (particularly motor sports) is essential.